These oven-roasted potato wedges are easy to make and are a healthier alternative to French fries. Also known as steak fries, potato wedges can be modified to be crispier or spicier with a few alterations. A few things to keep in mind when selecting potatoes for this recipe (and others). Just like apples, potatoes are prone to bruising, so handle them carefully, and store them in a cool, dark, well-ventilated place (not the refrigerator). Potatoes stored in a place that is too hot will lose their natural sweetness, as the sugar will convert to starch. When buying potatoes, choose clean, smooth, firm potatoes. Pick potatoes that are roughly the same size to ensure that they'll cook evenly. Try to select regular-shaped potatoes (ones without a lot of lumps and bumps) to avoid excess waste when peeling. And never use wilted potatoes or those with wrinkled skins, soft dark spots, cut surfaces or green areas. Green spots mean the potato has been exposed to light. It's best to cut off any spots before cooking to eliminate bitterness. Some potatoes are sweeter than others; for example, red-skinned potatoes, which have whiter flesh, are sweeter than brown russet varieties. Experiment with different types of potatoes to find your favorite (just be aware that different colors mean different flavors and outcomes). Cut each potato in half lengthwise. Cut each half, lengthwise, into four equally sized wedges. Add the potato wedges to a large mixing bowl with the rest of the ingredients. Toss meticulously to coat the potatoes evenly. Place the potato wedges, skin side down, on the foil. Be sure to space evenly, so they cook uniformly. Bake for 35 minutes, or until well browned, crusty around the edges and tender. Serve immediately, and sprinkle with more salt if desired. 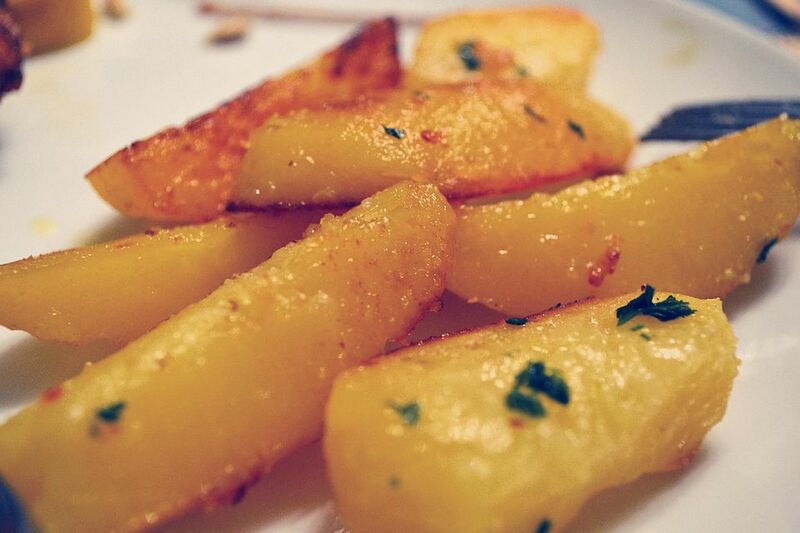 For thinner, crispier fries, cut each potato into 16 wedges. Bake at 400 F for 45 to 50 minutes, turning once. To make Spicy Potato Wedges, toss the oil-coated potatoes with 1 teaspoon chili powder, 1 teaspoon paprika and 1/4 teaspoon garlic powder. Add salt to taste. To make Parmesan Potato Wedges, toss the oil coated potatoes with 3 tablespoons grated Parmesan cheese, 1/4 teaspoon garlic powder and 1/4 teaspoon paprika. Add salt to taste.